You may have seen “ghosting” (also known as offsetting, shadowing, or repetitive print) in WX-engine printers, such as the HP 8100 and HP 5si-series, as a line that repeats down the length of a printed page. You also may have figured out that the distance between the original image and the “ghost” image is equal to the circumference of the upper fuser roller. While replacing the fuser rollers frequently may provide temporary relief from ghosting, the following four steps will correct the root causes. 1. Check the Upper Fuser Roller Bias Voltage. A negative bias voltage is applied to the upper fuser roller to “repel” the negatively charged toner. 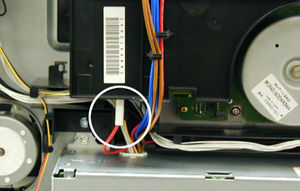 This voltage can be checked on the bottom of the High Voltage Power Supply (HVPS) unit during printing by measuring the voltage of the single red wire going off toward the fuser. If the voltage is not 60v for HP 5Si-series printers, 90v for the HP 8100, replace the HVPS unit. Check voltage of the red wire from the HVPS during printing. 2. Upgrade the DC Controller. RH4-0188-05 – 190˚ C, letter/A4 ledger/A3 paper size only. RH4-0188-06 – 190˚ C for all printer supported paper outputs. 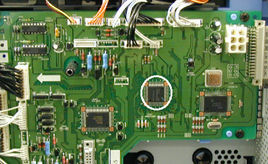 White circle indicates location of IC201 controller. 3. Upgrade your Fuser Assembly in HP 5si-series printers. The HP 8000 and HP 5Si fuser assemblies are almost identical, except that the HP 8000 has a metal lower fuser cleaning roller. This metal cleaning roller (see below), also called a cold offset roller, pulls un-fused toner away from the roller surface, as toner adheres more readily to its somewhat cooler surface than the surface of a fuser roller surfaced with a TEFLON® brand coating. 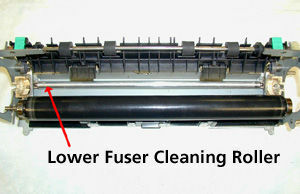 HP 8000 fuser assembly showing lower fuser cleaning roller. To address ghosting problems for HP 5Si printers, you may want to modify the existing fuser assembly with a Modification Kit (RG5-4447-CL-KIT) to add a cleaning roller to it or you may want to purchase a HP-brand fuser assembly from Katun (RG5-4447-000) and install it in your HP 5si-series printer. Note: The HP 8100 fuser is not interchangeable with either HP8000 or 5Si fuser assemblies.